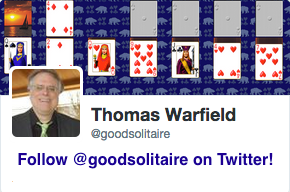 Screen shot of the game Two Cells from Pretty Good Solitaire. 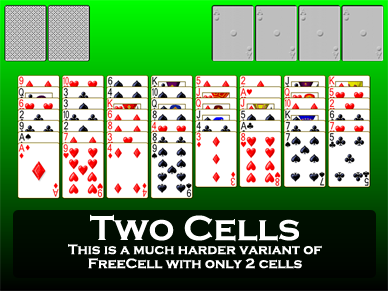 TTwo Cells is a very simple variation of FreeCell. 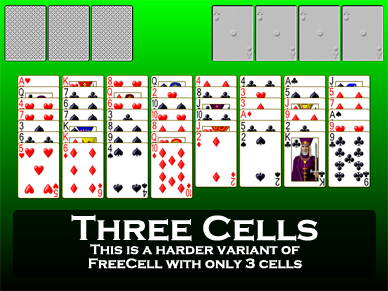 It is simply FreeCell with two cells instead of four. It makes the game much more difficult. Two Cells begins by dealing out all 52 cards into 8 tableau piles. The first 4 piles will have 7 cards, the last 4 only 6 cards. All the cards are face up, which makes Two Cells an open game. The object is to build 4 foundation piles up in suit from Aces to Kings. In addition to the foundations and tableau, there are 2 cells. Each cell is a storage place for one card. Any available card can be moved to an empty cell, and cards in the cells can be moved either back to the tableau or to the foundations. The tableau piles are built down by alternate color. Moving groups of cards is not strictly allowed in Two Cells. However, as a shortcut you can move groups of cards if you could move them one at a time using empty cells or tableau piles. If you have all both cells empty, for example, it would be possible to move a group of 3 cards in sequence down by alternate color by moving the top 2 cards to the cells, then moving the 3rd card, then moving the 2 cards back from the cells to reform the group. 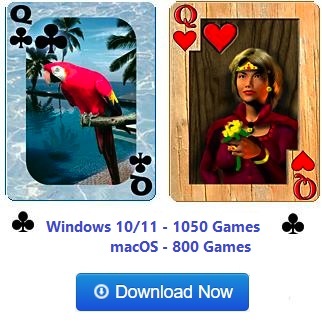 The effect of this is that the number of empty cells determines how many cards you can move as a group. It is very important to try to keep the cells as empty as possible so that you can move more cards around in the tableau. Another effect is that clearing a tableau pile also greatly increases the number of cards you can move as a group, since the empty pile can be used not only to store one card, but an entire group of cards. 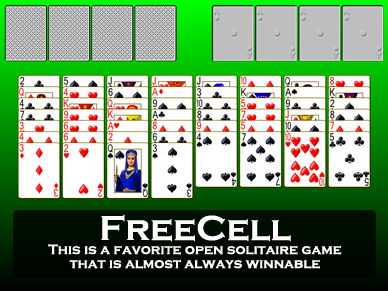 Two Cells is much harder to win than FreeCell. Average players win it about 15% of the time, but much better scores are possible. Very good players can win nearly 80% of the time over a large number of games.